← How prevalent are non-overlapping generations? 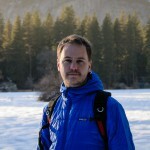 This guest article by Martin Sikora is cross-posted from the Computational, Evolutionary and Human Genomics blog at Stanford University. Reconstructing the demographic history of species and populations is one of the major goals of evolutionary genetics. Inferring the timing and magnitude of past events in the history of a population is not only of interest in its own right, but also in order to form realistic null models for the expected patterns of neutral genetic variation in present-day natural populations. A variety of methods exist that allow the inference of these parameters from genomic data, which, in the absence of detailed historical records in most situations, is often the only feasible way to obtain them. As a consequence, it is generally not possible to empirically validate the parameters inferred from genomic data in a direct comparison with a known “truth” from a natural population. Furthermore, until recently, the application of these methods was limited to model organisms with well-developed genomic resources (e.g., humans and fruitflies), excluding a large number of non-model organisms with potentially considerable evolutionary and ecological interest. Gillete’s Checkerspot (Euphydryas gillettii). Photo taken by Carol Boggs, co-advisor of Rajiv and one of the senior authors of the study. 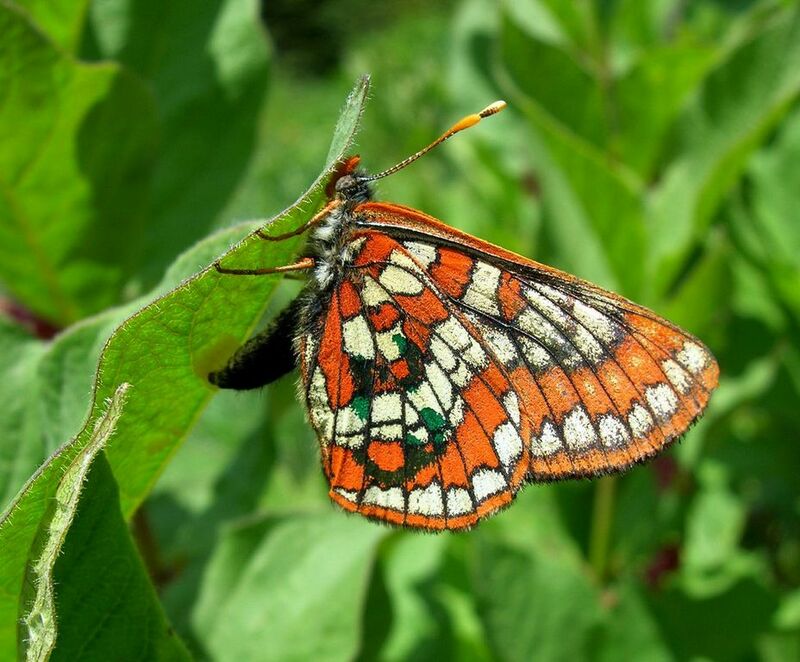 In an elegant study recently published in the journal Molecular Ecology, Rajiv McCoy, a graduate student with Dmitri Petrov and Carol Boggs, and colleagues tackle both of these problems in natural populations of Euphydryas gillettii, a species of butterfly native to the northern Rocky Mountains. About 30 years ago, a small founder population of this species from Wyoming was intentionally introduced to a new habitat at the Rocky Mountain Biological Laboratory field site in Colorado, and population sizes were recorded every year since the introduction. The beauty of this system is that it allows the authors to perform a direct comparison of the known demography (i.e. a recent split from the parental population and bottleneck ~30 generations ago, with census data in the newly introduced population) with estimates inferred from genomic data. 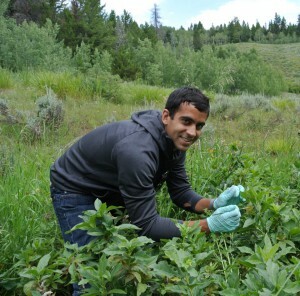 Lead author Rajiv McCoy, sampling larvae of Euphydryas gillettii. The researchers sampled eight larvae each from both the parental as well as the derived population for this study. In the world of model organisms, the next steps for constructing the dataset would be straightforward: Extract genomic DNA, sequence to the desired depth, map to the reference genome and finally call SNPs. In the case of E. gillettii however, no reference genome is available, so the authors had to use a different strategy. They decided to use RNA-sequencing in order to first build a reference transcriptome, which was then used as a reference sequence to map against and discover single nucleotide variants. An additional advantage of this approach is that the data generated can potentially also be utilized for other types of research questions, such as analyses of gene expression differences between the populations. On the downside, SNP calling from a transcriptome without a reference genome is challenging and can lead to false positives, for example due to reads from lowly expressed paralogs erroneously mapping to the highly expressed copy present in the assembled transcriptome. The authors therefore went to great lengths to stringently filter these false positive variants from their dataset. For the demographic inference, McCoy and colleagues used δαδι (diffusion approximation for demographic inference), a method developed by Ryan Gutenkunst while he was a postdoc in the group of CEHG faculty member Carlos Bustamante. This method uses a diffusion approximation to calculate the expected allele frequency spectrum under a demographic model of interest. The observed allele frequency spectrum is then fit to the expected spectrum by optimization of the demographic parameters to maximize the likelihood of the data. δαδι has been widely used to infer the demographic history of a number of species, from humans to domesticated rice, and is particulary suited to large-scale genomic datasets due to its flexibility and computational efficiency. Excerpt of Figure 2 from McCoy et al., illustrating the demographic models tested using δαδι. The authors then fit a demographic model reflecting the known population history of E. gillettii, as illustrated in Figure 2 of their article (Model A). Encouragingly, they found that the model provided a very good fit to the data, with an the estimate of the split time between 40 and 47 generations ago, which is very close to the known time of establishment of the Colorado population 33 generations ago. Furthermore, they also tested how robust these results were to using a misspecified demographic model, by incorporating migration between the Colorado and Wyoming populations in their model (which in reality are isolated from each other). However, both alternative models with migration (Models B1 and B2) did not significantly improve the fit, again nicely consistent with the known population history. Finally, the researchers also tested the robustness of the results to variations in the number of samples or SNPs used in the analysis, from datasets simulated under the best-fit model A. They found that δαδι performed remarkably well even with sample sizes as low as three individuals per population. While this is in principle good news for researchers limited by low number of available samples, one has to be aware of the fact that this results will be to a certain extent specific to this particular type of system, where one population undergoes a very strong bottleneck resulting in large effects on the allele frequency spectrum. A good strategy suggested by McCoy and colleagues is then to use these types of simulations in the planning stages of an expirement, in order to inform researchers of the number of samples and markers necessary to confidently estimate the demographic parameters of interest. For me, this study is a great example of how next-generation sequencing and sophisticated statistical modeling can open up a new world of possibilities to researchers interested in the ecology and evolution of natural populations. McCoy and colleagues constructed their genomic dataset essentially from scratch, without the “luxuries” of a reference genome or database of known polymorphisms. Moving forward, Rajiv has been busy collecting more samples over the past year. He and his colleagues plan to sequence over a thousand of them for the next phase of the project, as well as assemble a reference genome for E. gillettii, and important next step in the development of genomic tools for this fascinating ecological system. This entry was posted in genomics, next generation sequencing, population genetics. Bookmark the permalink.